Pre-Order Sleeping Beauty: Diamond Edition For $19.99 - Low Price Guarantee! You are here: Home / Great Deals / Amazon Deals / Pre-Order Sleeping Beauty: Diamond Edition For $19.99 – Low Price Guarantee! Pre-Order Sleeping Beauty: Diamond Edition For $19.99 – Low Price Guarantee! OK, Disney fans – we finally have a deal on Sleeping Beauty! 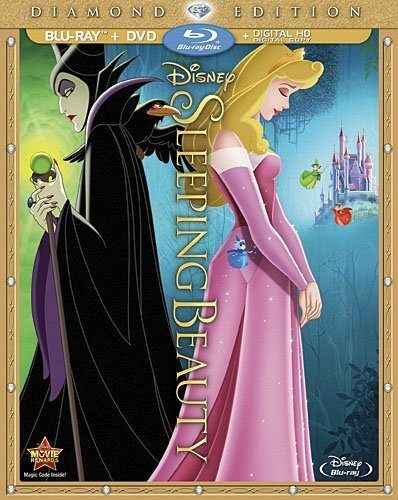 Right now, you can pre-order the Sleeping Beauty: Diamond Edition on Blu-ray/DVD for $19.99 (reg. $36.99)! Or, you can get it on DVD for $17.99! And, shipping is FREE with Amazon Prime or Super Saver Shipping! This is the only princess movie we have left to see, and I’ve been waiting for a deal on it! I’m grabbing it for my daughter for her upcoming birthday! And, don’t worry – if you pre-order it now and the price goes down, you’ll get the lowest advertised price! Fall under the glorious spell of Disney’s Ultimate Princess Fairy Tale! The magic is real as you experience all the pageantry and power on Blu-ray — and for the first time ever on Digital HD — with incredible high-definition picture and thrilling, soaring sound! Beauty, wonder and adventure spin together in a grand legend that transcends time as Maleficent, one of animation’s most spectacular villains, sends the kingdom’s beloved Princess Aurora into an enchanted sleep. In a majestic story that awakens all your senses, Good Fairies arm brave Prince Phillip to defeat a fearsome fire-breathing dragon and rescue Aurora. But success in battle may not be enough, for the only way to awaken the Princess is with True Love’s kiss! Create memories that will last a lifetime with Disney’s illustrious SLEEPING BEAUTY — a must-own for every family’s classic collection!